Punk bands have produced an abundance of poetic texts, some crude, some elaborate, in the form of song lyrics. 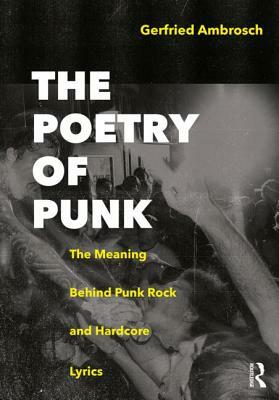 These lyrics are an ideal means by which to trace the developments and explain the conflicts and schisms that have shaped, and continue to shape, punk culture. They can be described as the community's collective 'poetic voice, ' and they come in many different forms. Their themes range from romantic love to emotional distress to radical politics. Some songs are intended to entertain, some to express strong feelings, some to provoke, some to spread awareness, and some to foment unrest. Most have an element of confrontation, of kicking against the pricks. Socially and epistemologically, they play a central role in the scene's internal discourse, shaping communities and individual identities. Gerfried Ambrosch holds a PhD in English and American Studies from the University of Graz. He spent several years working and researching in London. He currently lives in Vienna, where he works for an international NGO. As a touring musician, he has intimate knowledge of the goings-on in international punk communities.